The Nightly Live Shows 10:30pm EST each night! Broadcasting live from Richardson, TX. Click here to see Resume. Click here to see the Celebrity Links!! Mike Handy Broadcasting live from Fort Worth, TX. Visit Mike Handy's Home Page. airs every Sunday Night at 8:50pm Est approx. Frank update: 5/28/10 Walden told us that Frank is planning to appear each Friday Night on the Live Show!!! So don't forget to tune in! Please let Frank know that how much you enjoy him back on the Friday night show live. Drop him an email. Previous Frank Updates PLEASE continue to send Get Well wishes and encouragements to YUSA and we will forward them to his wife Bobbie. Send a card to Bobbie as well, if you can, to let her know you are thinking of her too. Frank Bresee c/o YUSA or email us with your wishes. Thank you for caring! We will keep you updated as news becomes available. Please continue to keep him and Bobbie in your prayers. Frank Bresee will be live at the top of the show. Please let Frank know that how much you enjoy him back on the Friday night show live. Drop him an email. We will have on live Tommy Cook who will be celebrating his 80th birthday on Monday 7-5-10. We will talk to Tommy about his career. Assorted old time radio shows like The salute to FDR on 4-15-45. Don't forget to give Walden a call at (714) 545-2071 and ask about radio from the good old days! Patricia and Walden will be celebrating Christmas in July. Patricia will conduct her trivia game, so call and answer one of Patricia's trivia questions and win a prize at (714) 545-2071. 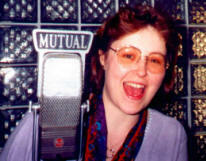 Don't forget to give Walden and Patricia a call at (714) 545-2071 and ask about radio from the good old days! Celebrate America's birthday with YUSA! 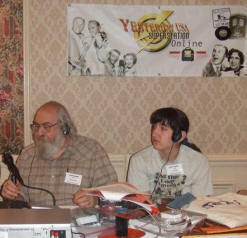 Don't forget to give Walden and Dr. Mike a call at (714) 545-2071 and ask them about radio from the good old days!